A program director shares expert advice. There are so many summer camps — and there's so little time to choose the right one! Fear not, parents; the next few months are a great time to narrow down your list of choices. First, are you considering a day camp or a sleepaway camp? If your choice is day camp, there's one thing you should be doing right now: Asking camp directors lots of questions. Ideally, these are answered at open houses, now being conducted throughout New York and New Jersey. As a longtime camp director, I've heard every question in the book (not to mention every parent's worst fears). My experience has taught me that parents need to know some very specific things as they go about making their final decision. Below are a selection of questions that parents should have in mind when they walk into a day camp open house. Questions: Where is my child picked up? Are the pickups supervised? Do I have a window of time for drop-off and pickup, or do I have to arrive at a set time? Sending your child off to a place that's not school or a family member's house can be a scary proposition. The better you feel about the logistics, the more comfortable you will feel overall. Simply put: A camp's pickup/drop-off routine should be easy to follow, and it should work for you! Questions for a commuter camp: What do the kids do on the bus? What kind of bus is used? Who exactly is on the bus? At my summer program, we like to say, "Camp starts on the bus!" And it really does begin there, with songs, games, and stories. It's camp on four wheels. I think that's a great thing, but it's not for everyone. Some kids may need quiet time on the bus; others may need immediate engagement and community. And not all buses are created equal. There are yellow school buses and the coach variety. The latter are more comfortable and come with lavatories, whereas school buses do not have them. Of course, the adults on the bus have a huge role to play, too. Find out how many counselors ride the bus with the kids and whether the bus drivers have worked for the camp in the past. Questions: What are the activities at camp? How is the daily schedule created? Is there balance between sports and arts activities? How many swims periods are there in a day? And how many of these are instructional versus free swim? Ultimately, your choice will probably come down to whether the range and type of activities offered at a camp are what your child wants. Campers should have both the freedom to try new things and to do beloved activities. Skill building plays big a role in boosting a child's confidence, which is one of the best things about summer camp. In terms of the ratio between sports and arts activities, there's no right or wrong proportion, but you should find out in which direction the camp leans. The last thing you want is for your child to feel that he is not among peers who share at least some of his interests. Of course, swimming is a crucial part of every kid's summer! It cools off hot heads (literally and figuratively), and it's a lifelong skill. Some camps emphasize swimming more than others. If your child loves the water, you will want to choose a camp that allows for lots of time in the pool. Questions: What is the overall philosophy of the camp? Is it competitive or more low key? Every camp has its own narrative, and you need to hear what it is straight from the camp director. The director should be able to tell you what he believes is best about the camp and what makes it unique. Questions: How does the camp handle communication with the parent? What does the staff do if the child is sick or injured? How does the camp handle possible difficulties, including bullying? So many things can happen at camp at any given moment. If bad things happen (a fight, illness, or injury), what does the camp do about it? Certain camps are better than others when it comes to troubleshooting with parents about their child's well-being and safety. Questions: Who are the staff members, and how are they selected? What kind of training and supervision do they receive? What is the retention rate for staff? Counselors can make or break a kid's summer. They really are that important. The norm is to have a week of staff training prior to the camp's start and a hierarchy within the camp that guarantees supervision for everyone. Ensure that the camp does background checks on staff members. It's also interesting to know how many counselors a camp retains from year to year. A high retention rate is a good sign as it means there's continuity. Alan Saltz has been the director of 92Y's camp program for 24 years. Under his leadership, 92Y has created several new programs that reflect New York City campers' wide array of interests and abilities. 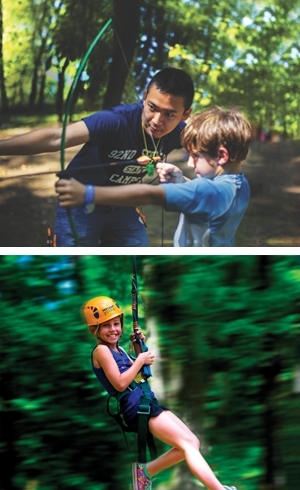 92Y's camps serve 1,500 children, ages 3-17, each year. Among others, its summer programs include Camp Yomi (ages 4½-9), Yomi Seniors (10-12), and Trailblazers (ages 12-14). For more information, please visit www.92y.org/camps.